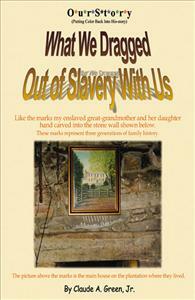 OurStory: What We Dragged Out of Slavery With Us sheds new light on the practices, customs, and events that continue to shape Black Americans today, and on their contributions to national and world culture. This poignant grassroots history, which draws on family memories, written narratives of slaves and former slaves, and facts gleaned from public records and historical journals, will enrich your understanding of how practices and traditions that grew out of the slave era—such as “Jumping the Broom”—continue to reverberate in the African-American psyche today. Author Claude Green provides an “up close and personal history” that offers new insights into how such carryovers still exert power, in ways that may be subtly disempowering. Only by becoming aware of the past, says Green, can one break free of its hold. I purchased this book for my son J Hunter Jr. A Senior in High School I think this will help to give a better understanding of the things that some how affect us without awareness. The book gave me, as a black female trying to find a mate, a better perspective of the black male and what was dragged out of slavery with him. It also, made me stronger to deal with black men and to raise my 3 boys to the awareness around how the chains today still take hold and how to break them. NEVER FORGET WHERE YOU CAME FROM, and if you don't know read this book and tell a friend. Did you know that strong black men were used to BREED strong young men? Of course to be stronger field hands. House to house they went.